What would motivate a man to make some little pink french cookies that he’s never had before? Well, lately I’ve been learning to code video games, and I’ve been working so hard at developing that craft that I’ve been neglecting my savory hacker duties. So I thought I would switch gears and clear my head. Secondly, they are a gorgeous looking food. Finally, they are French. I’ve never been to France but I’ve been really into French food lately and I wanted to experience a bit of their culture. I went online and watched Beth’s Foolproof French Macaron Recipe on YouTube like 4 times (no joke). If you follow this recipe, I would highly recommend doing the same. She clearly points out pitfalls to watch out for and what results you should look for. People have been saying how difficult and time-consuming making macarons will be, but honestly after watching Beth’s video, they were pretty simple! This was my first attempt and they turned out fantastic. I did have help from my sous chef (and the love of my life) so that helped too! 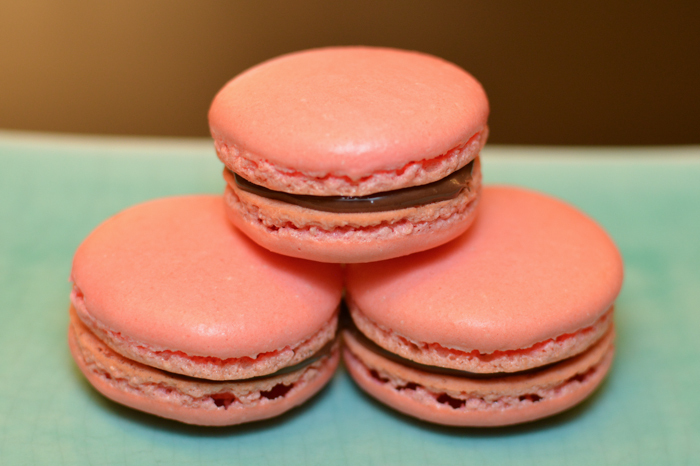 As you can see, the texture of macarons when done correctly have these little feet-like bottoms that are all rough. 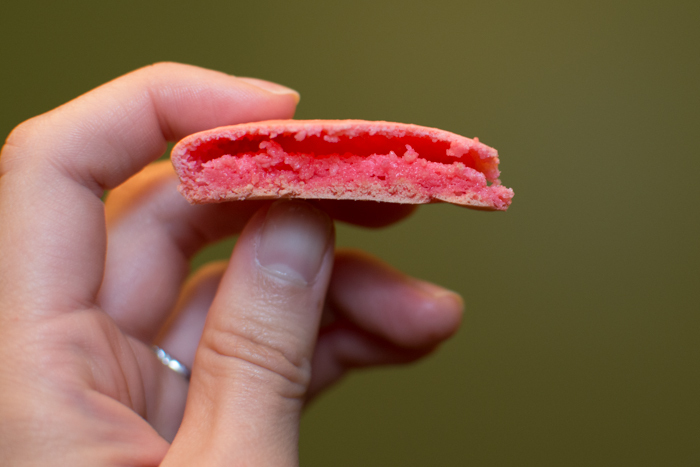 This is key to making sure that the macarons are firm, yet light and easy to chew. Kind of like firm cotton candy. This was my first time having a macaron, so I wasn’t sure what to put in the middle of the sandwich. Beth recommends something kind of tart to balance out the sweet. I didn’t have the time to create the berry filling that she showed, so instead I defaulted to Nutella, french preserves, and frosting. All of these were good but I have to say, they were indeed a bit too sweet. I would recommend taking Beth’s advice and using something tart in the middle. When I was done, I was curious about the insides so I cut a cookie in half. I’m assuming that this is the ideal texture since our photos closely resemble those seen on other recipe sites. These were easy to eat and similar to cotton candy. In the end, even though they taste great and look so pretty, you may think you’d like to make like 2 dozen… but don’t. Trust me, one per person will be enough! By the way, if you’re anything like us, you may be interested in knowing the difference between a macaroon and a macaron!